General Description: The Greenbrier is a medium to large, side notched, auriculate point with broad weak side notches. The prime identification aspects of the blade are heavy grinding in the shoulders and hafting area and fine secondary edge flaking. The blade shape is basically triangular and varies from recurvate to straight due to resharpening of the blade edges. Resharpening was typically accomplished at a steep angle which resulted in bifacially beveled blade edges. The blade edges usually include fine serrations. The Greenbrier, due to the following variants is a difficult point to type and identify. The ground base of the Greenbrier can take on a variety of outlines; it can be concave, lobbed, eared, straight or bifurcated. To further complicate identification matters, very early examples can be fluted. The hafting area displays broad side notches which are created as the shoulder tapers into the expanded stem. It is believed that this type developed from the Dalton type as well as from the Clovis type and then later evolved into the Pine Tree type. 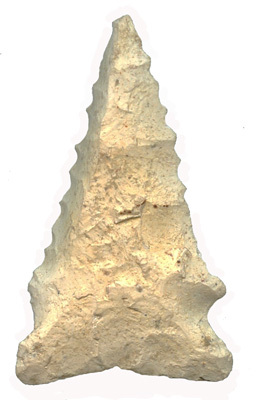 At the Hester site in Mississippi (Brookes 1975) a large number of Greenbrier points were recovered which revealed a wide range of manufacture and resharpening stages. 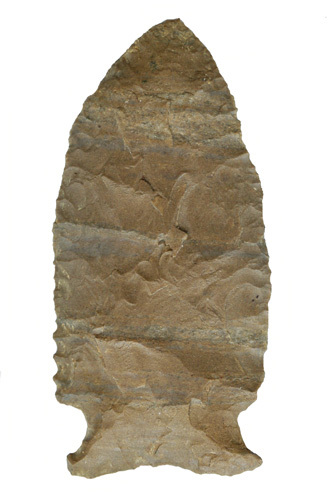 Edge wear on these specimens indicated use as both knives and spear points. The Greenbrier was named by T. M. N. Lewis in 1958 for examples which recovered from the Nuckolls' site in the Greenbrier area of Kentucky Lake, Tennessee. The size of the Greenbrier can range from 40 mm to 80 mm in length based upon a small sample size (6).